Do clouds have any weight at all? After all, don’t they float like a balloon in the air filled with helium? If you attach a helium balloon the the platform of a kitchen scale it wouldn’t register any weight at all, so why would a cloud? To answer this, let me ask if you think atmospheric air has any weight, this is actually the more important question. 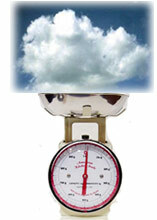 Are you familiar with air pressure the tool known as a barometer are? If yes, then you understand that air DOES carry weight. At 0′ (sea level), the weight, or pressure, of air is approximately 14.5 lb.. PSI (1 km per sq. centimeter). If air has weight, then it must also possess density, which is the weight of a chosen volume, for example cubic inches or cubic meters. If clouds consist of particles, then they must possess weight and density, correct? The answer to why clouds seemingly “float” lies in the density of the sheer volume of cloud material, being less than the density of a similar amount of dry air. As oil floats above H2O because it possesses less density, clouds seemingly “float” on the air due to the moister air in clouds possessing less density than dryer air. Where is Hoover Dam located? In Black Canyon across the Colorado River between Arizona and Nevada, about thirty miles east of Las Vegas, Nevada, and a couple of miles from Boulder City, Nevada. How high is Hoover Dam? It is slightly over 725 feet from foundation bedrock to the road on the top. The towers and decor on the parapet soar forty feet above the crest. How much does the Dam weigh? What type of dam is Hoover Dam? Made from concrete, an arch-gravity type, in which the water load is borne by both gravity and horizontal arch action. What is the water pressure at the base of the dam? Approximately 45,000 pounds per square foot. How much concrete did the dam require? 3.25 million cubic yards of concrete! There are more than 4,300,000 yards of concrete within the dam, the power building and related works. This much concrete could construct a monument 100 feet square and 2-1/2 miles tall; would be higher than the Empire State Building; or would provide a standard two lane highway sixteen feet wide, from San Francisco all the way to New York on the East Coast. Initial concrete used in construction of the dam was set on June 6, 1933, and the final portion on May 29, 1935. About 160,000 cubic yards were added to the dam per month. At the peak, placements were more than 10,000 cubic yards a day, including concrete placed in the intake towers and power plant), and just over 275,000 cubic yards in a single month. How much cement was required? What is hydrology and what do hydrologists do? Water is one of our most precious natural resources. Without it, there would be no life on earth. Hydrology has evolved as a science in response to the need to understand the complex water system of the earth and help solve water problems. This hydrology primer gives you information about water on Earth and humans’ involvement and use of water. Water is one of our most important natural resources. Without it, there would be no life on earth. The supply of water available for our use is limited by nature. Although there is plenty of water on earth, it is not always in the right place, at the right time and of the right quality. Adding to the problem is the increasing evidence that chemical wastes improperly discarded yesterday are showing up in our water supplies today. Hydrology has evolved as a science in response to the need to understand the complex water systems of the Earth and help solve water problems. Hydrologists play a vital role in finding solutions to water problems, and interesting and challenging careers are available to those who choose to study hydrology. Estimates of water use in the United States indicate that about 355 billion gallons per day (one thousand million gallons per day, abbreviated Bgal/d) were withdrawn for all uses during 2010. This total has declined about 17 percent since 1980. Fresh groundwater withdrawals (76.0 Bgal/d) during 2010 were 8 percent less than during 1980. Fresh surface-water withdrawals for 2010 were 230 Bgal/d, 18 percent less than in 1980. Much of our water use is hidden. Think about what you had for lunch. A hamburger, for example, requires water to raise wheat for the bun, to grow hay and corn to feed the cattle and to process the bread and beef. Together with french fries and a soft drink, this all-American meal uses about 1,500 gallons of water–enough to fill a small swimming pool. How about your clothes? To grow cotton for a pair of jeans takes about 400 gallons. A shirt requires about 400 gallons. How do you get to school or to the store? To produce the amount of finished steel in a car has in the past required about 32,000 gallons of water. Similarly, the steel in a 30-pound bicycle required 480 gallons. This shows that industry must continue to strive to reduce water use through manufacturing processes that use less water, and through recycling of water. Hydrology is the science that encompasses the occurrence, distribution, movement and properties of the waters of the earth and their relationship with the environment within each phase of the hydrologic cycle. The water cycle, or hydrologic cycle, is a continuous process by which water is purified by evaporation and transported from the earth’s surface (including the oceans) to the atmosphere and back to the land and oceans. All of the physical, chemical and biological processes involving water as it travels its various paths in the atmosphere, over and beneath the earth’s surface and through growing plants, are of interest to those who study the hydrologic cycle. There are many pathways the water may take in its continuous cycle of falling as rainfall or snowfall and returning to the atmosphere. It may be captured for millions of years in polar ice caps. It may flow to rivers and finally to the sea. It may soak into the soil to be evaporated directly from the soil surface as it dries or be transpired by growing plants. It may percolate through the soil to ground water reservoirs (aquifers) to be stored or it may flow to wells or springs or back to streams by seepage. The cycle for water may be short, or it may take millions of years. People tap the water cycle for their own uses. Water is diverted temporarily from one part of the cycle by pumping it from the ground or drawing it from a river or lake. It is used for a variety of activities such as households, businesses and industries; for irrigation of farms and parklands; and for production of electric power. After use, water is returned to another part of the cycle: perhaps discharged downstream or allowed to soak into the ground. Used water normally is lower in quality, even after treatment, which often poses a problem for downstream users. The hydrologist studies the fundamental transport processes to be able to describe the quantity and quality of water as it moves through the cycle (evaporation, precipitation, streamflow, infiltration, ground water flow, and other components). The engineering hydrologist, or water resources engineer, is involved in the planning, analysis, design, construction and operation of projects for the control, utilization, and management of water resources. Water resources problems are also the concern of meteorologists, oceanographers, geologists, chemists, physicists, biologists, economists, political scientists, specialists in applied mathematics and computer science, and engineers in several fields. Hydrologists apply scientific knowledge and mathematical principles to solve water-related problems in society: problems of quantity, quality and availability. They may be concerned with finding water supplies for cities or irrigated farms, or controlling river flooding or soil erosion. Or, they may work in environmental protection: preventing or cleaning up pollution or locating sites for safe disposal of hazardous wastes. Persons trained in hydrology may have a wide variety of job titles. Scientists and engineers in hydrology may be involved in both field investigations and office work. In the field, they may collect basic data, oversee testing of water quality, direct field crews and work with equipment. Many jobs require travel, some abroad. A hydrologist may spend considerable time doing field work in remote and rugged terrain. In the office, hydrologists do many things such as interpreting hydrologic data and performing analyses for determining possible water supplies. Much of their work relies on computers for organizing, summarizing and analyzing masses of data, and for modeling studies such as the prediction of flooding and the consequences of reservoir releases or the effect of leaking underground oil storage tanks. The work of hydrologists is as varied as the uses of water and may range from planning multimillion dollar interstate water projects to advising homeowners about backyard drainage problems. The Colorado River is one of the most important water systems in the United States. Draining watersheds from seven western states, it is divided into two major districts, the Upper Basin comprised of Wyoming, Colorado, Utah, and New Mexico, and the Lower Basin formed by Nevada, Arizona, and California. With its headwaters in Wyoming and Colorado and its mouth (until recently) flowing into the Gulf of California, this river serves as a focal point for both prehistoric and historic events in the West. The Colorado courses through Utah in a southwesterly direction and has two major tributaries, the Green and San Juan rivers, with smaller, additional sources flowing in from east and west. During prehistoric times it constituted a permeable boundary between the Anasazi populations to the south and east, and the Fremont and western Anasazi populations to the northwest and west, respectively. The Anasazi farmed tributary canyons and alluvial bottom lands where soil was rich and water adequate. These early Indians also created a system of trails that crossed both the San Juan and Colorado rivers. Spanish and Anglo-Americans later used some of these paths in their exploration and settlement of the West. Historic Native American groups living along the Colorado include the Paiute in southwestern Utah, the Ute in southeastern Utah, and the Navajo south and east of the confluence of the San Juan and the Colorado. This latter group has a rich body of lore concerning the river, which they say has a female spirit name “Life Without End.” She, and her male counterpart, the San Juan, form a protective boundary that skirts the reservation lands. In the past, Navajo ceremonies like the Blessingway provided protection for events and locations within this area, while beyond this line Enemyway and Evilway applied. Navajo raids across these rivers were a common occurrence during the 1850s and 1860s, and to a lesser extent in the 1870s. The Spaniards provided the first documented information about the Colorado, giving the river various names, such as El Rio de Cosninas, de San Rafael, and de Tizon. Various Spanish parties visited the river, the most famous one in Utah being the Dominguez-Escalante expedition in 1776. As the two padres returned to Santa Fe, New Mexico, through southwestern Utah, they came upon an old Ute trail in an area that appeared otherwise impassable. Chiseling steps and smoothing a path for livestock, the missionaries forded the river at what was called the Crossing of the Fathers, which now rests under the waters of Lake Powell. During the 1820s and 1830s, Euro-American mountain men ventured down and trapped parts of the Colorado. Famous personalities like Jedediah Smith, James Ohio Pattie, and Ewing Young searched for beaver along its banks, while another trapper, Denis Julien, left his inscription in Cataract Canyon. Although these men explored sections of the river, it was not until 1869 and again in 1871-72, that the Colorado was fully mapped. John Wesley Powell’s two expeditions, sponsored by the Smithsonian Institute and Congress respectively, charted the water’s course from Green River, Wyoming, through the Grand Canyon and beyond. His ten- and eleven-man crews collected information and sailed their wooden boats down one of the most dramatic and roughest inland waterways in the United States. Many people in Utah came to cross or visit the river but, with the exception of Moab where the water was calmer and the flood plain wide, few came to stay. For instance, the Mormons built the Hole-in-the-Rock trail in 1880, but once across, they moved on to the quieter San Juan. Charles Hall, a year later, placed into service a thirty-foot ferry boat to handle the traffic on the route between Bluff and Escalante; insufficient business caused Hall’s Crossing to close three years later. Even Hite City (1883), named after Cass Hite, a prominent prospector, was a boom-and-bust mining town on the Colorado that lasted only seven years. After the placer gold was removed from the gravel bars located at sites like Dandy’s Crossing and Ticaboo, the miners left their claims in search of better paydirt. Few were truly successful. Men with gold in their dreams again ventured forth in the 1890s. For about ten years, individual miners and companies with dredges tried to force riches out of the San Juan and Colorado rivers, but achieved little wealth. They, like the others, left. The 1930s and 1940s saw the introduction of a more profitable trade on the Colorado–river running and tourism. Norman Nevills, for example, headquartered at Mexican Hat and turned the red waters of the San Juan and Colorado into green cash as recreation became increasingly important. Even with the introduction of the Glen Canyon Dam in the 1950s and Lake Powell in the 1960s, there was still plenty of white water and red rock for adventurous souls to find the isolation and excitement they desired. And later, when its tributaries were heavily committed to irrigation and culinary use, the Colorado remained a playground for kayakers, rafters, and tourists. Today, the Utah portion of the Colorado River continues to offer not only its water as a resource, but also its beauty and adventure to those who come to its banks. The unregulated inflow volume to Lake Powell in May was 2,377 thousand acre-feet (kaf) (101 percent of average). The release volume from Glen Canyon Dam in May was 652 kaf. The end of May elevation and storage of Lake Powell were 3619 ft (81 feet from full pool) and 13.67 maf (56% of full capacity), respectively. The reservoir reached a seasonal low elevation on March 15th near elevation 3593.85 feet. Since that time the reservoir elevation has been increasing and will continue to increase throughout mid-summer as runoff from snowmelt and precipitation enter the reservoir. To view the most current reservoir elevation, content, inflow and release, click on: Lake Powell Data. To view the most current reservoir elevation projections, click on: Lake Powell Elevation Projections. To view the 2017 progession of snowpack above Lake Powell, click on Lake Powell Snow Chart. The operating tier for water year 2017 was established in August 2016 as the Upper Elevation Balancing Tier. The April 2017 24-Month Study established that Lake Powell operations will be governed by balancing for the remainder of water year 2017. Under balancing, the contents of Lake Powell and Lake Mead will be balanced by the end of the water year, but not more than 9.0 maf and not less than 8.23 maf shall be released from Lake Powell. Based on the most probable inflow forecast, this May 24-Month Study projects a balancing release of 9.0 maf in water year 2017. Reclamation will schedule operations at Glen Canyon Dam to achieve as practicably as possible the appropriate total annual release volume by September 30, 2017. In June, the release volume will be approximately 750 kaf, with fluctuations anticipated between about 9,000 cfs in the nighttime to about 15,000 cfs in the daytime and consistent with the Glen Canyon Operating Criteria (Federal Register, Volume 62, No. 41, March 3, 1997). The anticipated release volume for July is 850 kaf with daily fluctuations between approximately 9,500 cfs and 17,500 cfs. The expected release for August is 900 kaf with daily fluctuations between approximately 10,000 cfs and 18,000 cfs. 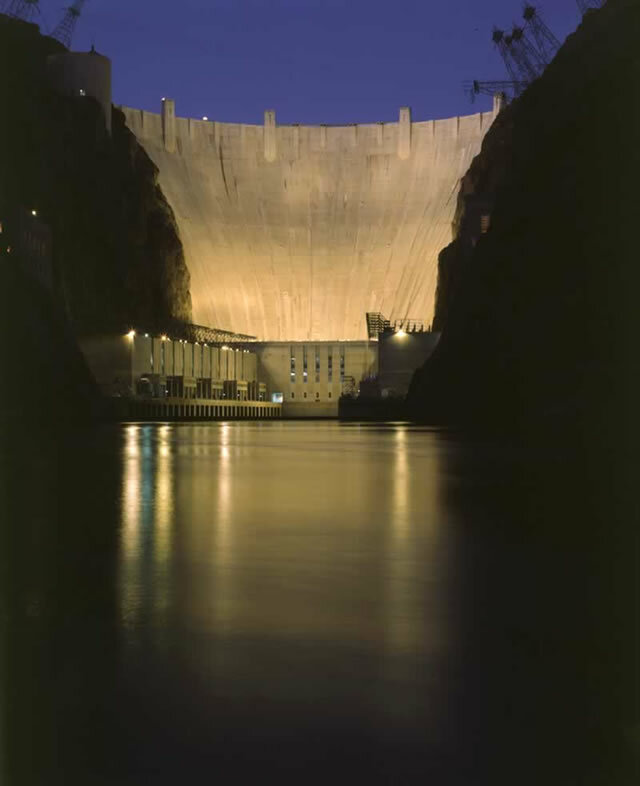 In addition to daily scheduled fluctuations for power generation, the instantaneous releases from Glen Canyon Dam may also fluctuate to provide 40 megawatts (mw) of system regulation. These instantaneous release adjustments stabilize the electrical generation and transmission system and translate to a range of about 1,200 cfs above or below the hourly scheduled release rate. Under system normal conditions, fluctuations for regulation are typically short lived and generally balance out over the hour with minimal or no noticeable impacts on downstream river flow conditions. The main stem of the Colorado River rises in the Rocky Mountains of Colorado, flows southwesterly about 1,400 miles and terminates in the Gulf of California. Its drainage area of 242,000 square miles in this country represents one-fifteenth of the area of the United States. Water is used for irrigation, municipal and industrial purposes, electric power generation, mineral activities, livestock, fish and wildlife, and recreation. Large amounts are exported from the system to adjoining areas. These reports reflect the Department of the Interior’s best estimate of actual consumptive uses and losses for each year within the Colorado River Basin. The reliability of the estimates is affected by the availability of data and the current capabilities of data evaluation. The reports include a breakdown of the beneficial consumptive use by major types of use (except mainstream reservoir evaporation), by major tributary streams, and, where possible, by individual States. The USGS monitors drought conditions across the Nation by comparing below-normal 7-day average streamflow with historical streamflow for that day of the year. Earth Resources Observation and Science (EROS) Drought Monitoring: A team of researchers from the EROS Data Center, the National Drought Mitigation Center, and the High plains Regional Climate Center are developing methods for regional-scale mapping and monitoring of drought conditions for the conterminous U.S.
U.S. Drought Monitor: a synthesis of multiple indices and impacts, that represents a consensus of federal and academic scientists. The product will be refined over time as we find ways to make it better reflect the needs of decision-makers and others who use the information. NRCS Water Supply Forecast: A water supply forecast is a prediction of streamflow volume that will flow past a point on a stream during a specified season, typically in the spring and summer. The NRCS, in cooperation with the National Weather Service, issues water supply forecasts for over 750 points in the western United States near the first of the month between January and June each year and at other times as requested. National Drought Mitigation Center: The National Drought Mitigation Center (NDMC) helps people and institutions develop and implement measures to reduce societal vulnerability to drought, stressing preparedness and risk management rather than crisis management. U.S. Seasonal Drought Outlook: The National Weather Service provides a seasonal drought outlook map based on many tools including forecasts, temperature and precipitation outlooks, and medium- and short-range models. Earlier this year, with the effects of a multi-year drought becoming even more serious, California Governor Jerry Brown (D) ordered cities and towns to cut water use by 25 percent. The State Water Resources Control Board later approved rules encouraging residents to let their lawns die. Meanwhile, farmers have struggled mightily to maintain their crops. Half of the fruits, vegetables, and nuts consumed in the United States are grown in California, and this crisis poses a serious threat to the state’s agriculture and the millions of Americans who rely on it. The shutdown has been made worse by the inaction of California’s Democrats, who for years have refused to build adequate storage facilities so that rainwater and snowmelt runoff can be stored for use by a growing population during dry years, another element of the earlier system. With no storage, the rain goes wasted. As fish go, it is undistinguished. Inedible, short-lived, and growing to a maximum length of just under three inches, smelt are of interest to nobody much — except, that is, to the implacable foot soldiers of the modern environmental movement, some of whom have recently elevated the smelt’s well-being above all else that has traditionally been considered to be of value. Human beings, the production of food, and the distribution of life-enabling water can all be damned, it seems. All hail the smelt, the most important animal in America. The Central Valley’s woes began in earnest in 2007, when the hardline Natural Resources Defense Council (NRDC) won a lawsuit against California’s intricate water-delivery system, sending farmers like John Harris into a tailspin. In court, the NRDC’s lawyers contended that the vast pumps that help to funnel water from the reservoirs up in the Sacramento–San Joaquin River Delta down to the Central Valley, to Southern California, and to the Bay Area were sucking in and shredding an unacceptable number of smelt — and, the smelt being protected by the Endangered Species Act (ESA) since 1994, that this was illegal. Given that the NRDC has long wished for farming operations in the valley to be curtailed on the peculiar grounds that it isn’t native to the area, this struck many observers as rather too convenient. … [But a federal judge] ruled that the protections afforded to the smelt were insufficient and ordered the federal Fish and Wildlife Service to issue a new “biological opinion” on the matter — this time without deciding that the smelt was in “no jeopardy.” And that, as they say, was that. … In 2007, the pumps were turned down; the Delta’s water output was lowered dramatically, contingent now upon the interests of a fish; and the farms that rely on the system in order to grow their crops were thrown into veritable chaos. Predictably, a man-made drought began. Approximately fifty participants [EPA Regions 8-10, western states (i.e., AK, CA, CO, HI, ID, NM, NV, OR, UT) and various other source water professionals] attended the May event held at the Asilomar Conference Grounds in Pacific Grove, California. The Forum brought together source water partners to share and discuss solutions to source water and groundwater protection challenges in the West. Day One of the Forum featured fourteen speakers covering a variety of topics linked to source water protection including: climate change; recycled water; fire; agriculture; low impact development; local collaboratives; and on-site wastewater management. Day Two utilized “Open Space”, a dynamic and engaging meeting technique, and featured nineteen breakout discussions covering a range of source water topics. Day Two also included a field trip to sites in the Carmel River watershed highlighting (1) the use of recycled water for irrigation and conservation of source water, and (2) water resource management in the Carmel River system. Day Three (a half day) involved: a review of breakout summaries from the Day Two; group prioritization of breakout topics warranting further discussion; a group exercise to draw links between priority topics; and a discussion of next steps. Attendees came away from the meeting energized from the presentations and discussions, with newly formed working relationships and constructive ideas for addressing source water protection issues. You will need Adobe Reader to view some of the files on this page. See EPA’s PDF page to learn more about PDF, and for a link to the free Adobe Reader. What is the California Water Plan? Required by the California Water Code Section 10005(a), the California Water Plan (Water Plan) is the State government’s strategic plan for managing and developing water resources statewide for current and future generations. It provides a collaborative planning framework for elected officials, agencies, tribes, water and resource managers, businesses, academia, stakeholders, and the public to develop findings and recommendations and make informed decisions for California’s water future. The plan, updated every five years, presents the status and trends of California’s water-dependent natural resources; water supplies; and agricultural, urban, and environmental water demands for a range of plausible future scenarios. The Water Plan also evaluates different combinations of regional and statewide resource management strategies to reduce water demand, increase water supply, reduce flood risk, improve water quality, and enhance environmental and resource stewardship. The evaluations and assessments performed for the plan help identify effective actions and policies for meeting California’s resource management objectives in the near term and for several decades to come. By statue, the Water Plan cannot mandate actions or authorize spending for specific actions. Each update makes neither project-specific nor site-specific recommendations; therefore, it does not include environmental review and documentation as would be required by the California Environmental Quality Act (CEQA). Policy-makers and lawmakers must take definitive steps to authorize the specific actions proposed in the Water Plan and appropriate the funding needed for their implementation. This underscores the need to have broad public participation and support for the Water Plan in order to have its objectives and recommendations realized. For almost 60 years, the Water Plan has served as the long-term strategic plan for informing and guiding the sound management and development of water resources in the state. With updates every five years, this plan reaffirms the State’s commitment to integrated water management. The development of the Water Plan dates back to the late 1800’s. The first plan, which covered ideas for water distribution in the state, was put together in 1873 (see Previous Reports). Subsequent reports (plans) were issued as California Department of Water Resources’ (DWR) bulletins. The initial Water Plan (known as Bulletin 3) was released in 1957 under the direction of DWR’s first Director, Harvey Oren Banks. The Water Plan was intended for “control, protection, conservation, distribution, and utilization of all the waters of California, to meet present and future needs for all beneficial uses and purposes in all areas of the state to the maximum feasible extent.” For the most part, Bulletin 3 and subsequent updates were technical documents focused on water supply development. Overtime, the plans were gradually expanded to reflect the growling conflicts over California’s limited water resources. Since Water Plan Update 1998, the Water Plan has moved from a technical document focused on water supply development to evaluating options for addressing pressing water issues in California. The California Water Plan Update 2018 is currently in development. Update 2018 and subsequent updates will provide a State venue for monitoring, evaluating, recommending actions, and adapting to keep California on a path of sustainability. Please visit the Update 2018 page for more up-to-date information.